Who doesn’t like to look cute and trendy, whether you’re with that special someone, with best friends or by yourself? Here are some fun outfits to wear on Valentine’s Day – you’ll be ready to spend the day any way you please. You can never go wrong with a fun and flirty dress for a formal night out. The booties add an edgy touch to an otherwise elegant look. A black cross body bag is a timeless accessory that perfectly complements this ensemble. For a touch of class, add a pair of dangling pearl earrings. This is a classic masculine look for anyone who wants to get dressed up — a simple slim-fit white shirt with black skinny pants. Add a leather belt and shoes to pull it all together. This look is for the guy who wants to look like he isn’t trying too hard but still thinks it’s important to look good. 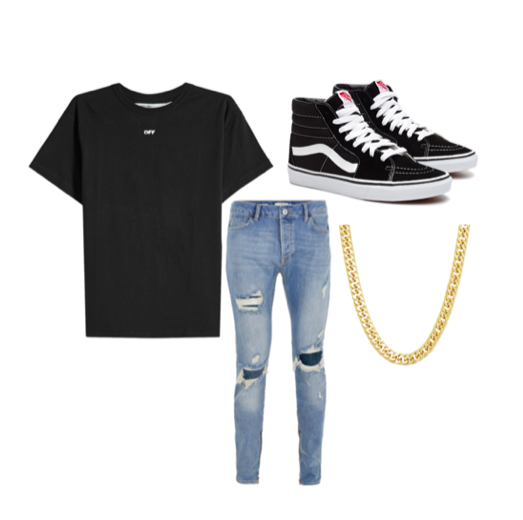 Pair a simple T-shirt, jeans and sneakers with a gold chain to create the perfect elevated but chill dinner outfit.